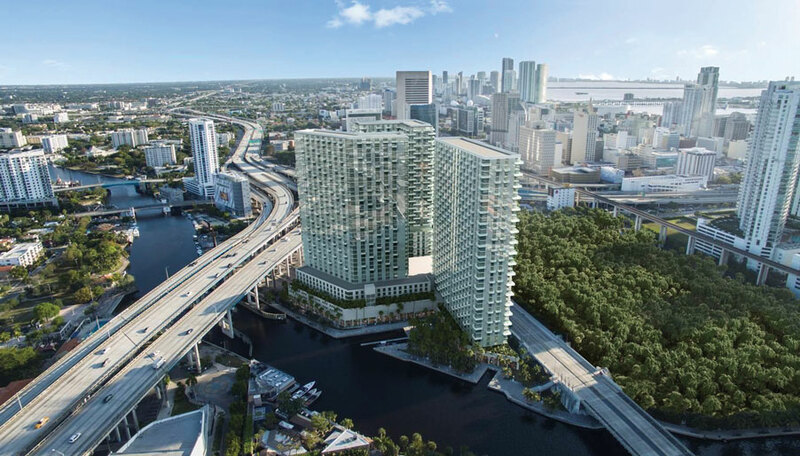 A complicated deal to gain a new office complex for the City of Miami in exchange for a triple tower private development on the Miami River is not as advanced as recently proclaimed. In fact, City Manager Emilio González said it’s far from being a sure thing. The deal arises from the city’s intent to sell or lease Miami Riverside Center, its office tower complex on the river at 444 SW Second Ave. Saying they had outgrown the building, city officials began to explore a sale or swap with a developer to gain a new main office building elsewhere. Negotiations between Lancelot Miami River LLC, an affiliate of the Adler Group, and the city have been ongoing for more than a year, yet there’s not been a peep publicly since the city commission hired an outside legal firm specializing in real estate to work in consultation with the city attorney in those negotiations. Any final deal would have to be approved by city voters. The city charter requires a referendum on any sale or lease of city-owned waterfront. Miami Today reported last week on a May 7 meeting of the Miami River Commission where an attorney for Lancelot, and officials with the city’s Department of Real Estate and Asset Management, gave the group a status report. Michael Llorente, an attorney for Adler, told river commissioners that negotiations had progressed enough to target the August primary election for the proposal, and the parties asked to go on the May 7 agenda. But at the May 7 meeting he said that “upon further reflection” they agreed to shoot for a November vote by the public, affording more time to work out details and get a full review by all players. He then asked to meet with the commission’s Urban Infill and Greenways Subcommittee in June, and the river commission July 9. River Commission Chair Horacio Stuart Aguirre approved that schedule. Miami Today’s front page article got the attention of City Commissioner Joe Carollo, who read portions aloud at the May 10 city commission meeting, before quizzing the city manager about the important matter. Mr. González said he did meet with an Adler representative as one of his first moves after beginning the city manager’s job in January. They talked about the deal and “I was not enamored … I put it on hold,” Mr. González said. The comments came up late in the meeting, which had spilled over from day to evening, and on the heels of Mr. Carollo complaining how lobbyists for Hyatt Regency did not register as lobbyists on Hyatt’s behalf until May 10 – the day of the meeting. Mr. Carollo wanted to know when Mr. Llorente had registered as a lobbyist for Lancelot (Adler). Questioning the status of the Riverside Center project also comes as some commissioners have complained of not being updated on major matters by the administration. Adler proposed to build new offices for the city elsewhere and turn the river site into Nexus Riverside Central – residential towers, a hotel, retail and restaurants. In early 2016, with the assistance of CBRE Inc., the city solicited proposals to relocate its administrative hub and subsequently dispose of the present facility. In December 2016, city commissioners conceptually approved the sale or long-term lease of the Riverside Center and development of a new city administration building. Commissioners authorized then city manager Daniel Alfonso to begin negotiations with Lancelot (Adler). Commissioners voted June 8, 2017, to hire Weiss Serota Helfman Cole & Bierman as special real estate counsel to work with the city attorney in those negotiations. Commissioners said the matter is so big and complicated they wanted an outside real estate expert to help the city get the best deal. The city administrative building is on choice land near downtown and Brickell, directly across the river from a planned mixed-use development to be called Miami River. The high-profile parcel is also next door to city-owned open green space with three boat slips. The 10-story office building is more than 25 years old and “unable to fully and satisfactorily meet the city’s future operating and client service needs,” the request for proposals said. Adler proposed constructing a 375,000-square-foot office building for the city elsewhere, with three possible locations listed: near the Lyric Theater in Overtown, next to Marlins ballpark in Little Havana, or as part of a mixed-use project on county land surrounding the Douglas Road Metrorail Station being built by an affiliate of Adler. Adler says it is “uniquely positioned to maximize the value to the [city property] given that Adler owns the adjacent property directly to the north, which includes the access easements to the [Miami Riverside Center] and the plaza in front of the city property. “Adler has a unique understanding of the MRC Property as it relates to all of the underlying easements and is in the best position to deliver and execute a plan to provide the city with a fair market value for the property,” the proposal read. Adler’s long-term plans for the river property would see the creation of Nexus Riverside Central, a project the company says would provide much-needed market rate housing and activate a stretch of the growing public riverwalk. The development would consist of about 1,350 residential units in three distinct towers, a 150-key hotel along the riverwalk, and about 30,000 square feet of retail and restaurants connecting and activating the area along the river to the frontage along Southwest Second Avenue and Southwest Third Street, according to the developer.